Located about 1200 light-years from Earth in the southern constellation of Carina (The Ship’s Keel), the Toby Jug Nebula, more formally known as IC 2220, is an example of a reflection nebula. It is a cloud of gas and dust illuminated from within by the central star, designated HD 65750. A telescope in Chile has snapped striking new images of an ethereal nebula 1,200 light-years from Earth with a rarely seen structure and a curious resemblance to a English toby jug. The European Southern Observatory unveiled the new image on Wednesday (Oct. 9) to showcase dazzling arcs of the nebula IC 2220 - nicknamed the Toby Jug Nebula - as seen by the observatory's Very Large Telescope. Researchers also used the telescope images from video tour of the nebula, which has a nearly symmetrical butterfly-like structure nearly a light-year wide. 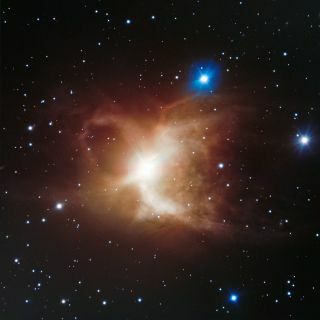 That structure is rare, ESO officials said, and is created by a short-lived phase of the star at the nebula's heart. The cloud of gas and dust illuminated by the star HD 65750 is what's known as a reflection nebula, ESO officials explained. The star created the nebula as it sloughed off some of its mass, which cools in space. "The dust consists of elements such as carbon and simple, heat-resistant compounds such as titanium dioxide and calcium oxide (lime)," ESO officials said. "In this case, detailed studies of the object in infrared light point to silicon dioxide (silica) being the most likely compound reflecting the star’s light." HD 65750 is a red giant star that is five times the mass of the sun. Red giants form when a star has exhausted most of its hydrogen, causing it to near the end of stellar evolution. Despite the fact that this star is at a more advanced stage of life than the sun, it is still much younger at about 50 million years of age, ESO officials said. Stars with more mass actually deplete most of their fuel more quickly than lower-mass stars like the sun. Scientists think the sun is about 4.6 billion years old. Billions of years from now, the sun will probably become a red giant. Eventually, the star will inflate far past the orbit of the Earth, "engulfing all the inner planets in the process," ESO officials said. By that point, however, Earth will already be an unpleasant place. The increase in radiation and strong winds from the dying sun will evaporate the oceans and end all life on Earth even before the planet is totally melted, ESO officials said. The European Southern Observatory is the most productive ground-based astronomical observatory in the world, according to the observatory. Austria, Belgium, Brazil, the Czech Republic, Denmark, France, Finland, Germany, Italy, the Netherlands, Portugal, Spain, Sweden, Switzerland and the United Kingdom support the organization.